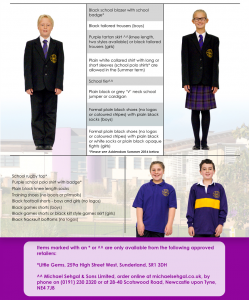 The Venerable Bede Church of England Academy has a uniform policy, which has the full support of the Academy Council. Details of the uniform are shown below. We believe that uniform plays an important role in the school ethos. Pupils need to be suitably dressed for the working day. A smart appearance helps to maintain high esteem in the community. Pupils must wear a blazer at all times and will need a sensible coat for inclement weather. No logos are to be displayed on items of clothing. Tracksuit tops, hoodies and denim jackets are not allowed. Trainers, trainer socks and boots are not allowed. Canvas/leather ‘Converse’ type shoes or plimsolls are not allowed. Outdoor coats should preferably be black, navy or blue. ^^Note: Our school skirts and ties are only available from Michael Sehgal & Sons Ltd.
No jewellery other than a watch (no SMART watches) may be worn. Make-up and nail varnish are not allowed including false nails. Hair accessories for the girls (e.g. headbands, slides, bobbles etc.) must be black. Hair may be worn no shorter than a No. 2 haircut and extreme hair styles (e.g. bleach blonde/coloured/shaved patterns etc.) are not acceptable. Earrings – no piercings are allowed. If pupils wish to have piercings, this must be arranged at the beginning of the six weeks holiday to allow healing. Any piercings are a potential health and safety risk. or Plain, black shoes (no logos or coloured stripes) with plain black or white socks or opaque tights for girls. Please note that boots, plimsolls and trainers including leather Converse are not allowed. All pupils have lockers available to them to store their coats, bags, change of footwear and to store Mobile Phones.